Many of us now have tattoos that decorate our bodies. Some have deep meanings, some are simply aesthetically pleasing and while the meaning might be known only by the tattooed, the beauty of the tattoo itself is visible to all. 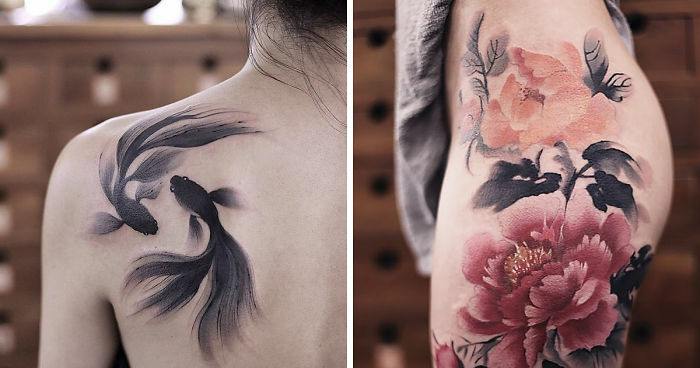 Chen Jie is a Chinese tattoo artist whose beautiful works have won over the hearts of over 200k people on Instagram and it's clear why. The artist creates intricate watercolour tattoos that look like real paintings that you can always bring with yourself. Take a look at some of her works below and vote for the best ones. Lo mismo! Delicate and classy. he really achieves a fine art image. Just gorgeous. I'd love to have a piece by her. She needs to be on Ink Master!! Quote the Raven never more!